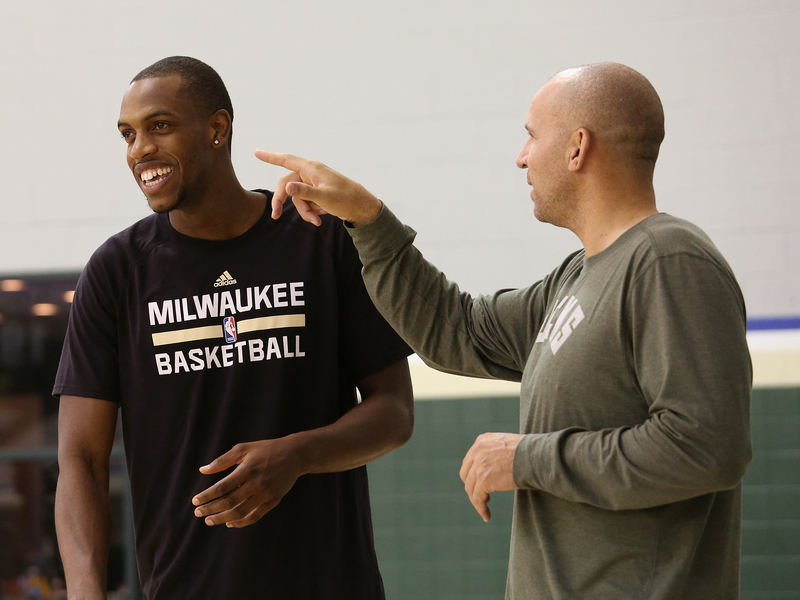 Bucks sharpshooter Khris Middleton's momentum was headed in the right direction, then he suffered a hamstring injury that almost changed the course of his career. Momentum is a peculiar element. It can propel you forward, while its inertia can prove devastating. Those poles converged at Khris Middleton’s hamstring this September. Luke Cage and Ray Donovan kept Middleton company during his post-op bed rest. He became hooked on The Get Down and laughed along with Entourage, Netflix derailing his plans to dive into two books. Crutches supported him for three weeks and he took his first ginger footsteps one month following surgery. “It was weird to know you can lose your walking and running form that quickly and how awkward it can be when you start doing it again,” Middleton remembered. Marvel’s first black, title-character superhero fueled Middleton's comeback. “Luke Cage is a beast, man. You can’t take that guy down no matter what,” Middleton said. The mantra seeped into each rep and every set. The Bucks’ training facility doubled as his comic book. “I told myself I was invincible. Nothing can stop me,” Middleton said. He bounded over hurdles, leapt laterally against the force of resistance belts and regained his balance on a state-of-the-art trampoline Milwaukee installed before the previous season. The Bucks’ training staff has leaned toward innovation since hiring Troy Flanagan in 2015. The players’ bodies are now being monitored and sculpted by the former Director of Sports Science and the Director of High Performance for the U.S. Ski & Snowboard Association, who also happens to boast a Ph.D. in aerospace engineering. “They get any and everything that they can to help us be ready and stay healthy,” center Greg Monroe said. Before games, six or seven Bucks simultaneously sprawl on the locker room floor, stretching with bands and crunching medicine balls during precious seconds most teams allot for on-court preparation. Middleton recuperated during coaches meetings. As Jason Kidd and his staff broke down film, assessed opponent scouts and organized practices, Middleton observed the proceedings. “He sat there quietly and listened and took notes,” Kidd said. “It was probably more like a class at Texas A&M for him.” It was a natural setting for Middleton. He’s painstakingly analyzed footage of Paul Pierce and Joe Johnson, digesting how to slither past more athletic opponents to score as prolifically as La La Land’s Justin Hurwitz at the Oscars. 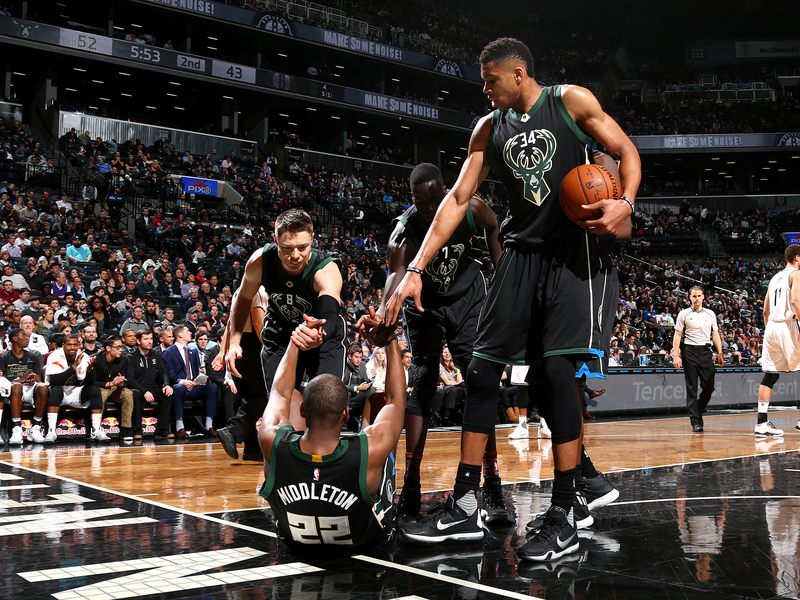 Kidd truly schooled Middleton on the court this fall. The benefit of suiting up for a former player, Middleton eased back into contact basketball activity by playing Kidd one-on-one in post-up situations. Milwaukee’s staff has consistently matched the team’s interminable wings against one another, inspiring skill development amidst competition. “It’s the one way of creativity, of understanding how to become creative, you gotta practice it,” Kidd said. And with Middleton, Giannis Antetokounmpo and Jabari Parker often drawing smaller defenders, Kidd encourages feeding the post. Many teams view that option as an antiquated action, but it’s one Kidd perfected during his 19-year career. He’d slip in nuggets of wisdom in between points against his 25-year-old two-guard. Middleton struggled fading over his left shoulder as the coach repeatedly crowded his shooting motion. “He gave me some nice tips to help me be more consistent with it,” Middleton said. A breakdown of different angles to utilize the glass completed Kidd’s master course. Eventually, Middleton graduated to live-ball action, butting heads with second-year guard Rashad Vaughn, catching and pump-faking and completing the drives like that explosive September play that ultimately derailed Middleton’s progress. “He just got stronger,” Vaughn said. “He looked like the old Khris, same great moves, same great pace.” He received a thumbs up from Milwaukee’s training staff on Feb. 8, returning to action ahead of schedule, five months after the crossroads of his professional career. Parker unfortunately tore his ACL just as Middleton’s returned, further delaying the Bucks’ trajectory behind a triumvirate of protracted players. Milwaukee’s training staff will have another rehabilitation project. They’re tasked with remolding another auspicious wing who is critical to the franchise’s future. The Bucks’ rise has certainly sputtered, but Middleton provides the example of riding the ebbs and flows.